Two books by Frank Peretti in the late 1980s influenced my views on spiritual warfare and unseen supernatural forces that are at work in our world. 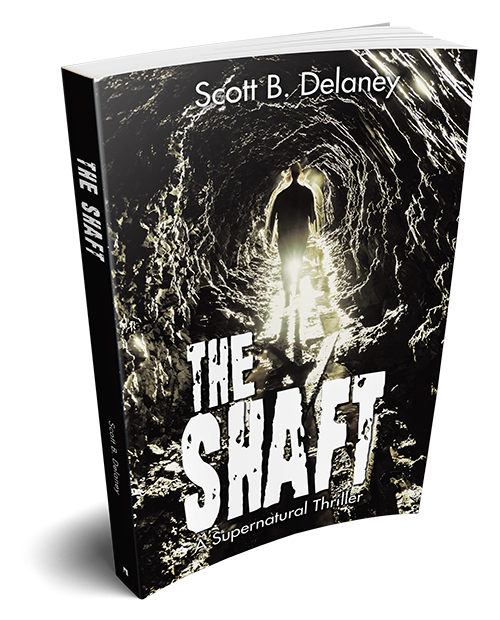 The Shaft is my way of bringing these questions back into today's world of cutting edge science, greed, and the questions of morality in our culture. I hope that it serves to challenge all of us with respect to our faith and our belief in whether Angels really do exist and how they interact with this world. The characters are an amalgamation of many friends, family members, leaders, work associates and other individuals that have served to influence my life in myriad ways. Many of the characters are developed around geographic stereotypes and necessary attributes that prepare them for the tasks that they must tackle in The Shaft. Nicolai Virshenko—or Niki, as his associates knew him—was perched on the weather-worn roof of an abandoned 1940s textile mill immediately adjacent to the Valley Baptist Temple of Portland, Oregon. The wind on that blustery winter day would make his assignment somewhat more difficult than anticipated, but weather was always a game changer in his line of work. In that particular case, he would have to account for the fifteen- to twenty-mile-per-hour gusts and make the appropriate last-minute adjustments when sighting in his target. As usual, the planning phase of his new assignment had started more than four weeks ago, which was the amount of time Niki always demanded from his contact for any assignment he was asked to accept. His military-strategy degree from West Point and his five years of service in Afghanistan had taught him many important lessons, not the least of which was that the planning phase of any mission, while usually the most time intensive, was the most important key to achieving the objective. His client, who referred to himself as Prometheus, had contacted Niki on his cell phone. In a recognizable baritone voice with a thick East European accent, he’d quickly delivered directions to the location where Niki could procure the typical manila envelope that afternoon. Inside the envelope, Niki would find a single sheet of paper with a brief overview of his assignment, including the name of the target; his or her age; a general description, including height, hair color, and weight; work and home addresses; the names of family members with the same appearance descriptors; the expected date of completion; and any additional pertinent information the client thought might be useful to Niki. Prometheus made no small talk when contacting Niki, a fact that pleased Niki to no end. This was strictly business. Niki, now thirty years old, had grown up in St. Petersburg, Florida, having been illegally adopted in 1988 from a small orphanage outside of Moscow by his first parents, Jeff and Nicki Farwell, two people with dreams of a family but without an appropriate understanding of the responsibilities that came with that change in their lives. Jeff was a successful neurosurgeon at Bayside General Hospital in nearby Tampa Bay, and he invariably equated success in medicine to the size of his bank accounts and the number of summer homes he owned and flaunted. Nicki was approaching forty-five years of age when her ob-gyn informed her that her ovaries did not appear to be viable and that fertility drugs, which had a somewhat questionable success rate in the early 1980s, were not likely to be effective. After three years of trying naturally and fearing that her age might lead to undesirable birth defects, Jeff and Nicki decided to adopt. Unfortunately, the Farwells didn’t have a lifestyle that allowed for the addition of a three-year-old toddler. After two years of nanny-aided child-rearing, an adulterous episode with an OR nurse, and the failure of two large capital investments in magnetic resonance imaging equipment made by Jeff during 1984, they decided to dissolve the marriage, leaving the question of what to do with an unwanted five-year-old Russian orphan named Niki. Between 1984 and 1996, Niki floated from one foster home to another, reassigned often because of his difficult-to-manage emotional issues and erratic, sometimes violent behavior. Niki was incredibly intelligent, scoring in the ninety-ninth percentile on his SAT. With the recommendation from a well-respected Florida state senator, which was the result of a well-written letter by Niki describing his life’s many hurdles and his focused desire to serve in the United States military, he was granted appointment to West Point. He dedicated himself to the study of war strategy and was the most decorated sharpshooter in his graduating class. After graduating with honors in 2000, Niki was commissioned to serve as a long-range target sniper in Afghanistan as part of a top-secret quasimilitary operation known simply as Deliverance. After five years of overseas active duty, Niki found himself less than infatuated with not only the war in Afghanistan but also the military in general. Over time, he became more and more belligerent and would regularly disobey orders, sometimes only for affect. After numerous incidents with both superiors and subordinates, Niki was dishonorably discharged and sent back to civilian life. Becoming a hired assassin gave him a new zest for life. The rush associated with that line of work was inebriating for Niki. A regular job was simply not a possibility. He craved control and the ability to solely determine when someone lived or died. Plus, with his connections and background, finding that type of work proved to be simple. The planning for his current operation wasn’t unique. In fact, the last three operations had been similar in that they’d involved targets who served in church-related positions, traveled infrequently, maintained fairly predictable weekly schedules, and lived and worked in places that didn’t maintain state-of-the-art security systems. That made the hits fairly easy to accomplish without significant risk of being captured on film or triggering an alarm system. Although the recent targets seemed vanilla compared to the usual marks, that was not Niki’s concern. A target was simply a target. The rationale behind the order to kill a human being was of little interest. For Niki, that question was simply unnecessary. The absurdly generous compensation for his work demanded that Niki maintain a level of human detachment that in many ways made him feel inhuman and devoid of any redeemable soul—the subject of many sermons forced on him by the churches he’d attended with his various foster families and the annoying chapel services that were part of the West Point core curriculum. His view of God was simple: God was a fantasy developed to fill the need of a desperate world that refused to accept that when life was over, it was just that—over. When planning for that type of assignment, Nicolai always spent two weeks shadowing the target in order to identify the work schedule, meal times, family interaction, and modes of transportation used each day. By the end of the second week, Niki tried to think like the target, which seemed to help him choose the appropriate method of murder with confidence. While shadowing each target, he would also spend countless hours on his laptop, searching for any and all internet information he could find on the person of interest. For the most part, that part of the planning phase was to avoid any unseen hurdles during the engagement, but in reality, Niki had accepted the fact that he needed to quell his curiosity about the mark. In quenching his thirst for that information, he felt superior to the mark, holding a power over the target like a skilled hunter who had tracked a trophy buck for weeks. He knew the trail the buck took each morning, the eating habits of the animal, how many other deer might be with him, and how skittish the buck could be at a tiny sound or unexpected smell. That knowledge was the hunter’s power; the weapon was merely an instrument. The target on that fateful day was Martin McBride, who’d been a senior pastor at Valley Baptist Temple for more than a quarter of a century. Niki’s careful shadowing of the pastor over the last two weeks and his attention to detail, including the reading of the last two weeks’ church bulletins while sitting through an arduously long Southern Baptist–style service last Sunday, indicated that Pastor McBride led a workshop known as Road to Recovery for alcoholics and past drug abusers at seven thirty on Wednesday evenings. Last week, after eating dinner with his wife, Dorothy, Martin had arrived twenty minutes early at 7:10, which had given him enough time to open the doors, turn on the lights, start a pot of coffee, and take ten minutes in the sanctuary to pray about the night’s meeting. If that night went off as planned, one of the meeting attendees would find Martin on the steps to the foyer that separated the main sanctuary from the family life center approximately ten minutes after the time of death. For that particular shot, Niki chose a Bushmaster Cobb BA50 sniper rifle with a twenty-two-inch barrel and custom-made muzzle silencer. A client in Mexico City had given him the gun as a thank-you for an earlier job in 2010. Where the silencer had been made or purchased was not of interest to Niki; he cared only that it was untraceable and effective. He had used the gun on many occasions but only when hunting deer or elk in the mountains of south-central Colorado, near Creede, where Niki maintained a small ranch and 1,200-square-foot log cabin. With the rifle, he was able to successfully kill a large elk from distances that exceeded 350 yards. Now, sitting on a rooftop approximately 150 yards from where the pastor would stand with his keys extended toward the dead-bolt lock on the mahogany double doors, having little wind to contend with at the moment, Niki knew the shot would not be a significant challenge. In fact, with a wry, contorted smile, Nicolai thought to himself that he might be able to make the kill with no more than the small .22-caliber rifle given to him by his first foster father, a rifle now reserved for occasional rabbit control in the garden outside his cabin. At 7:06, as Nicolai continued to polish the barrel of his finely crafted weapon, he noticed a caramel-colored car heading up West Main Street approximately four blocks away. As it approached the church, Niki could tell it was Pastor McBride’s 2004 Honda Accord. Careful not to move a muscle as the car pulled into the church parking lot directly in front and to the left of his position, he waited patiently as Martin wheeled his way to his reserved spot near the side entrance of the church offices. Niki deftly raised the rifle, placing the stock carefully on top of the small sandbag resting on the old building’s brick ledge. The expertly trained marksman focused the powerful scope on the door as if to pick his spot and then slowly eased the rifle back in the direction of the pastor, who was slowly walking toward the double doors, twirling his keys in his left hand as he gazed adoringly at the stained-glass windows that framed the sanctuary. As Martin took his last step on the earth, he was unable to hear the almost inaudible click and whoosh of air immediately before the bullet from Niki’s gun hit its mark.